Amazon recorded another quarterly loss last week; a big issue was costs associated with Amazon Prime. Can Amazon.com (NASDAQ:AMZN) ever make money with Amazon Prime as its growth driver? That's a question shareholders have to be asking following the latest quarterly loss by the company. Growth in the second quarter was strong once again at 23%, with sales reaching a solid $19.3 billion. However, Amazon booked a loss of $126 million, or $0.27 per share, and unhappy investors pushed the stock down after the report. Why exactly is Amazon struggling to make a profit despite its retail dominance? Amazon Prime has been amazingly successful at bringing in top-line growth to the company and value to customers through services such as free shipping and streaming video once one is a member. But you can see below that while sales have increased 1,190% over the past decade Amazon net income has hovered just around break-even. A major reason for that is costs associated with Amazon Prime. As the number of Prime users has grown -- reaching an estimated 27 million today -- costs for streaming content and shipping have increased as well. Since Amazon doesn't break out its streaming content costs directly it's difficult to know what it's spending for this part of the Prime service, but we do know that technology and content costs have grown from 7% of sales to 11.5% in the past three years, so the trend is for higher technology and content costs. However, it does give more information on fulfillment and this is where the data become very concerning. Amazon relies on the U.S. Postal Service and shipping companies such as UPS and FedEx to deliver goods to customers and if these entities raise costs, which they've slowly done over time, there's little Amazon can do in response outside of building its own delivery network. But that would cost tens of billions of dollars and take years to accomplish, so Amazon remains reliant on these shippers. As you can see below, growth in Prime members has coincided with a rapid rise in fulfillment costs as a percentage of sales. 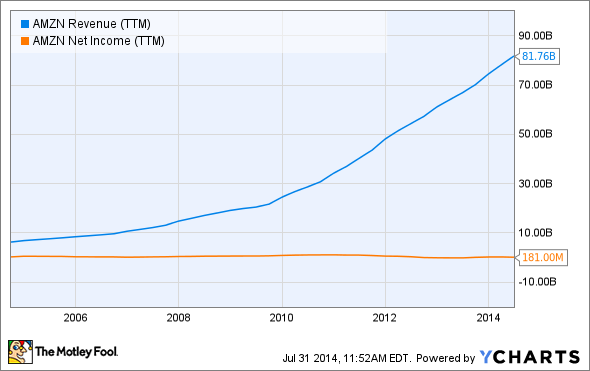 When combined with increasing technology and content costs you get the anemic net income numbers we see today. The other challenge is that Amazon may not have a lot of room left to raise prices on what it sells to consumers. In recent years, the company has actually raised margins to a level competitive with other retailers, but that hasn't led to a profitable business in large part because of fulfillment and streaming content costs. 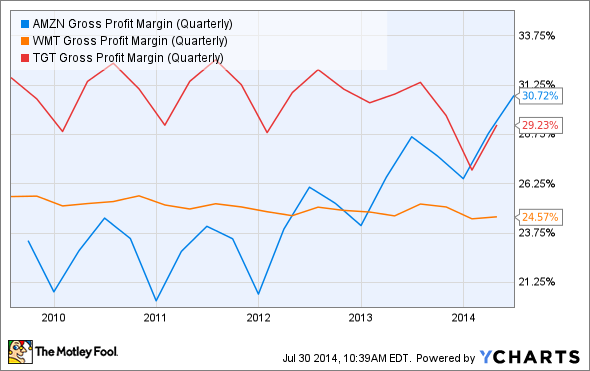 AMZN Gross Profit Margin (Quarterly) data by YCharts. If growth is the only goal, Amazon Prime is worth every penny but eventually the market may require a sign of long-term profit potential from the company. With content and fulfillment costs rising, I don't see that upside, particularly given that Amazon is already squeezing about as much margin out of each item it sells as competitors. Amazon faces fundamental challenges in transitioning from growth to profits, and I don't see how the company does that with Prime as a central driver of value for customers. The costs of shipping and streaming content are simply too high. Clearly, the market hasn't cared about profits at Amazon in the past, but that may be changing; if it does, Amazon will have a lot to prove. Bottom line: I don't think the transition will be easy.